Gene heals all friendly Brawlers around him 200 health per second. A brawler with an extremely long range and a ultimate that can pull brawlers to him to melee range. 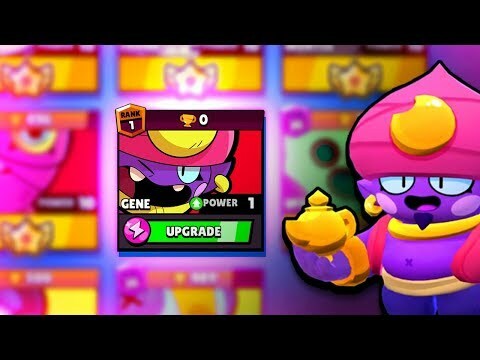 Super can work against you when you make poor decisions, such as pulling Jessie or Penny turrets. Avoid pulling close range duelers like Bull or Shelly to you. 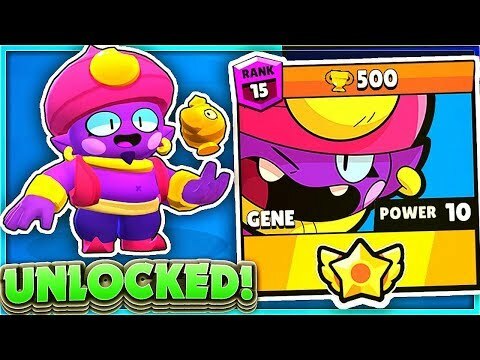 Gene's Super can cancel the Supers of other Brawlers like Frank's or Brock's. Gene can be played as a poker, or suppressor. His shots can provide cover fire and keep the enemy team from healing or pushing. You can extend how far your Super pulls someone by walking backwards as soon as you launch your Super. It is also extended if Gene uses a Launch Pad while firing his Super. Gene shoots a solid ball of magical smoke from his lamp. If the ball doesn't hit a target, it splits up and spreads the damage in a cone. Gene launches a magical hand from his lamp. If the hand hits an enemy, they get pulled back to Gene's location!